I was the Musical Director for a play that had its run this past weekend. As we were striking the set at the Opera House on Sunday, I was walking downstairs and two Mormons were making their way up. Myself and a few other people were carrying things down and the Mormons asked if we needed any help. I said, "I don't think there is any soliciting here." I went outside for a moment. When I came back in they were kind of just standing around watching the cast and crew break everything down. Then they left. It was amusing. they would be apologizing for trying to make crazy naked woman their 3rd wife...how preposterous is that? Ha! I think every religion out there should have a Department of Apology to apologize to everyone it has excluded, oppressed, vilified, and sacrificed in the name of [fill-in-the-blank deity]. I guess the Mormons are just making it official? It's funny how the word "apologist" and "apology" seem as if they're related. It sounds as if an "apologist" is one who apologizes, but in reality the two words aren't related to each other at all. An "apologist" is one who writes or debates "apologetics", which can loosely be described as defending a particular school of thought. It's mostly used for talking about defending religious institutions (ie. Christian Apologetics), but it can also relate to anything political or academic. Don't worry - if you have an address and a front door, mormon apologists will likely visit you at some point or another. As a Mormon, a long-time fan of Bizarro and fanatic follower of the Bizarro Blog, I hereby issue a blanket apology to Dan Piraro: "We're sorry." Bryan: Hahaha! Very funny! Yay for the Mormon apologist :)) Hats off (if I had one) to your sense of humour! Dan, "Cleaning Fanatic" and the path it took during and after its creation are truly hilarious. I enjoyed everyone's comments, too! People in Salt Lake use Mo as a prefix to connote an association with Mormons. 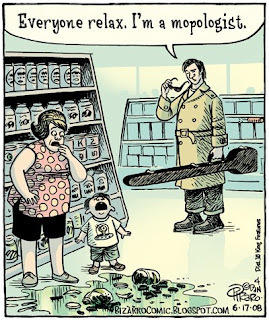 So the proper pronunciation would be Mo-Pologist, rather than the Mop-Ologist that the cartoon assumes. Love Bizzarro, BTW. Been reading it for years. For some reason I read "Mopologist" as "mope"-ologist. As in one who studies the art and/or science of moping. Which, I guess I'd do if I was a mopologist and dared call myself that. Shame that everything Mormon appears negative. Bryan R. Terry's comments are right on. Apparently Bizarro has at least 2 fanatic followers, who are also Mormon. BTW: Next time I'm at Sunday School I'll ask about the chicken feet & wings. You always come up with some cool, dadaist ideas for the strip--outside of any real point, which can be the point after all. 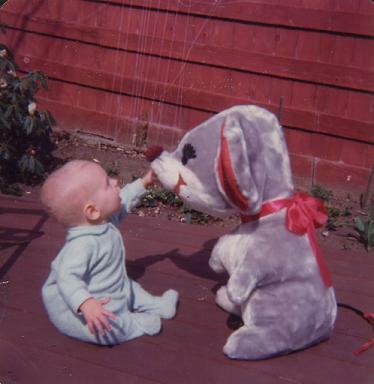 i used to be a mopologist....a janitor, that is, not a mormon apologist. i think bryan r terry deserves an award here for retaining is sense of humor in the midst of the mormon bashing. ~ okay, so it wasn't really bashing so much as a little smooshing.